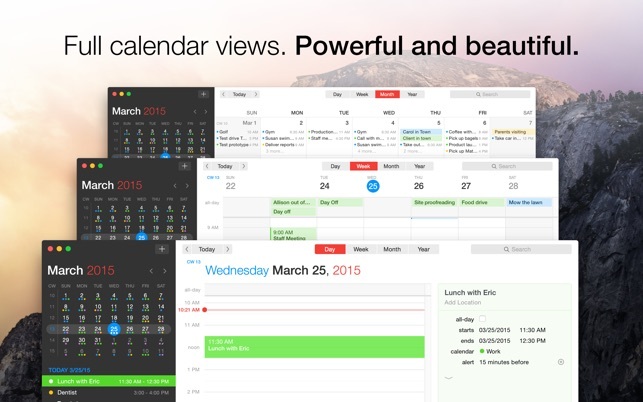 Designed exclusively for macOS, Fantastical 2 includes powerful features such as an incredibly intuitive parsing engine, a full calendar window (with day, week, month, and year views), a quick access mini window, iCloud reminders support, time zone support, and much, much more. 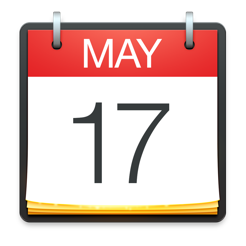 Fantastical 2's natural language event and reminder creation, beautiful calendar views, and ultra-smart event list make it the best calendar and reminders app you'll ever use. 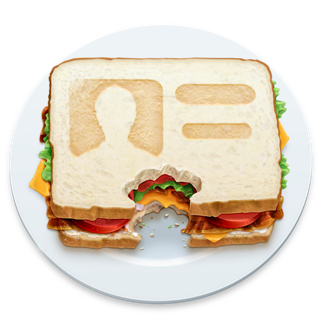 Just type in that you have "Lunch with John on Friday at 1pm" and Fantastical 2 will schedule it! Or type in "remind me to Buy Milk on Tuesday" and Fantastical 2 will create a reminder with a due date! • Start typing your event or reminder in any of these languages and Fantastical will automagically understand! 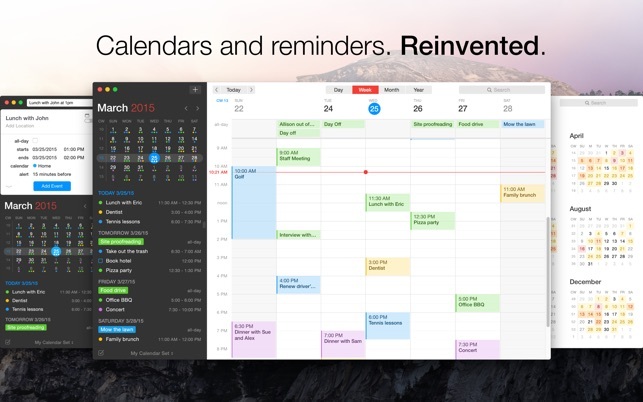 Fantastical 2 — the frustration of calendaring has been solved. 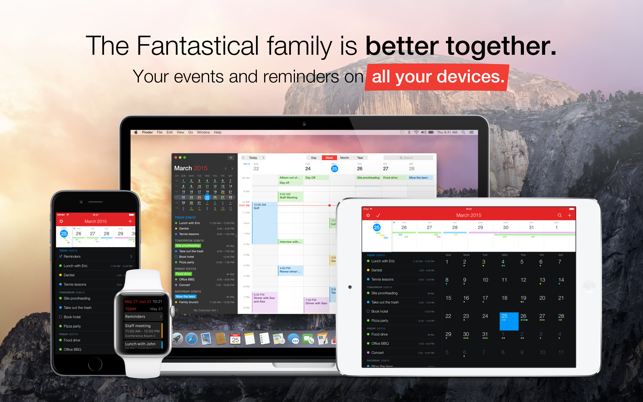 I’ve been using Fantastical since its very first version, and it remains to this day my “use-it-every-day-all-the-time” ulitlity, on my desktop, laptop, phones and iPads. 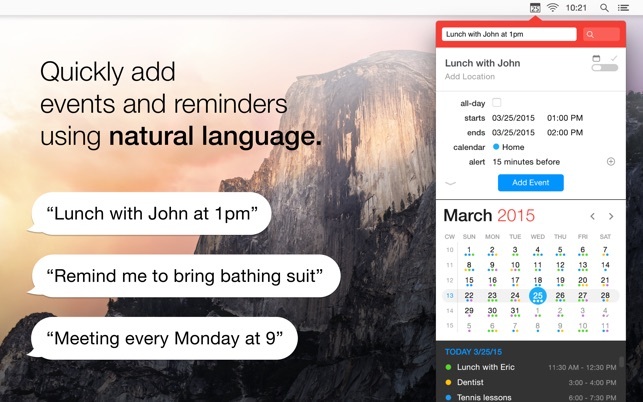 Fantastical’s best feature is its “plain language” ability to create new events. Works nearly flawlessly to parse dates, times and complicated recurring events (“first day of the month,” "second Tuesday of the month,” etc.). The user interface is excellent, even on small phone screens. Most importantly, this app is dependable, reliable. It syncs flawlessly with itself on all my devices, very quickly. Handles invitations from Outlook users well, and handles locations/maps well, too. 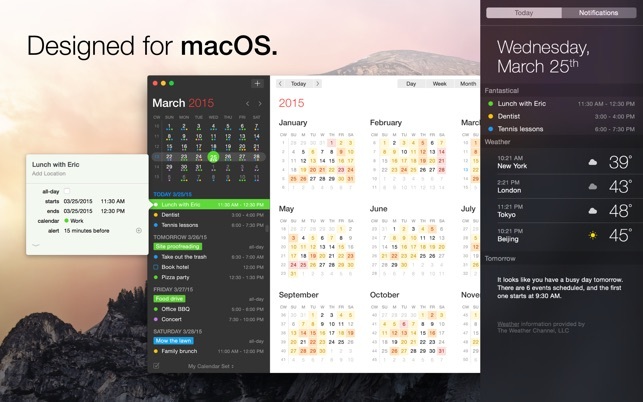 Integrates smoothly with Google calendars and with Apple Calendar. Handles shared ICS event files flawlessly. If I have any complaint (a minor one), it’s that I’d prefer to be able to tweak my user interface a bit, such as enlarging text on the iPhone version, adjusting (‘toning down”) the app’s jarring red color banner, etc. The iOS version works well. I’m hoping the developers create a “shortcut” capability (other than Siri, which it already has) to allow users to enter events directly from the new Apple “Shortcuts” app, without having to open Fantastical on the phone. This is a first class app, made for people who use it - and depend on it - heavily. I bought Fantastical V1 right when it was first released and have loved it right up till this morning. I held off upgrading when V2 came out because I was perfectly happy with the last version of V1, and didn’t feel like spending the money. It was an expensive upgrade back then as now. However, the latest version has improved on things to the point where I felt it was only right and proper that I upgrade, though I’m still not happy about the pricing, and, despite that, I’m happy that I did so: from the new color schemes to the wealth of additional data that’s now available (time to leave, which I want to see if it works with public transportation here in NYC), I’m happy. Had there been a reduced price for those upgrading (on top of a generally lower price overall), even so long after V2 first came out, this would’ve been a 5-star review. Instead, a star loss because of the price. If you’re still using V1, I think it’s time to come around and support the developer, despite the lack of an upgrade price. If you’ve never used it before, you’ll be very happy with it. The ease of the drop-down calendar from the top-line menu is simply terrific and I’ve used that all the time. I bought this quite a while ago and don’t write too many reviews unless I really like an app. I tend to be willing to try knew things, but ultimately I’d say 90% of the time I drop an app. I have a nice long list of app purchases that simply don’t provide any value at all. This is not one of those apps. How do I know this? Well, I just bought a new MacBook and thought I would pass on installing this. And within 2 days I was running back to my app library to click the install button. It is simply a much better calendar. I like the list on the side. I like the way I can easily enter a new entry. I find it a MUST HAVE on the iPhone. And now without even realizing it, I find it a must have on the Mac as well. You know an app is good when you keep coming back to it. For that to happen it has to provide some kind of value that you will miss if you stop using it. This does that. Let me say one more thing. I’m not someone who is married to the calendar and log every thing to it. And I still find this so much better.